It was in November 2014 whilst visiting Folkestone, Kent, where thousands of service people from the last two World Wars left the shores of England to sail to conflict on French beaches and also returned following the aftermath of the 1940 Dunkirk retreat, that I saw the Road of Remembrance . 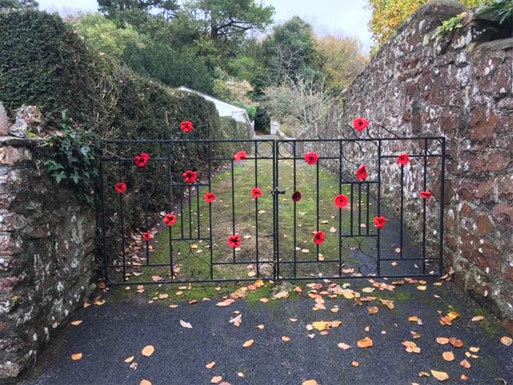 In memory of these events the people of Folkestone had decorated the railings along the route with knitted poppies. It was a hugely moving sight and left me with a lasting memory. As we moved towards the World War 1 Armistice Centenary, I was reminded of the Folkestone tribute, and thought something similar could be created on the elevated pavement railings in Bishopsteignton. 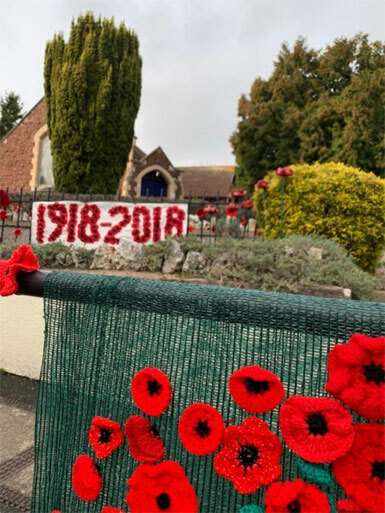 In previous years, on the 11th November 2016 and 2017, we had displayed a net of three hundred knitted poppies in front of Bishopsteignton’s War Memorial, so to create a significant display would be a one-off spectacle to mark such an historic event as the Armistice Centenary. 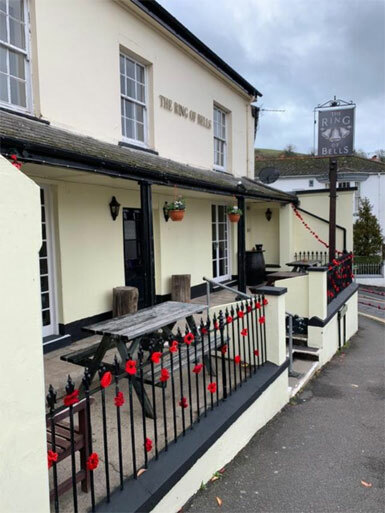 The original aim was to create one thousand poppies to be attached to the black railings from the War Memorial down Fore Street to the Ring of Bells. It was October 2017 when I sourced poppy patterns and bought red and black wool and started to knit. I carried my knitting to the pub and started to talk to people about the idea. Some of my local knitting group said they would help. Also, friends, neighbours, people that I spoke to in the pub, my relations, and Tony, my partner, all said they would contribute by making poppies. We realised that if we were going to achieve one thousand poppies, more people needed to be involved. 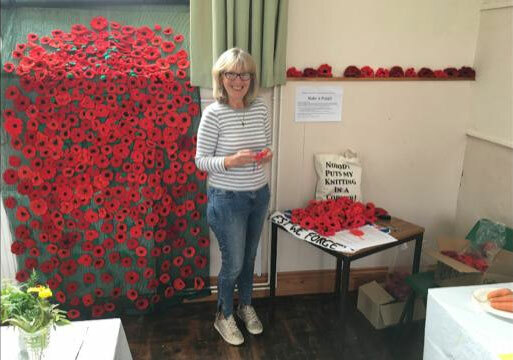 We displayed poppies at the Village Show in September receiving a good response; with many people enlisting to help and taking away pattern sheets. The Parish Chronicle, which reaches many homes in the village, published the patterns. Bishopsteignton Banter and the Parish Council website were kind enough to post the information as well. Poppies of all shapes and sizes arrived at my door. Every poppy was a work of art in itself, there were differing shades of red, some purple to remember the animals that died in warfare, and a few white poppies for peace and to remember stretcher-bearers killed in the trenches. 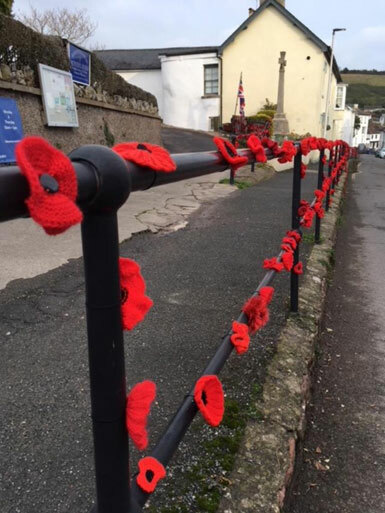 A number of people knitted one hundred poppies; some knitted one poppy. Every poppy was very much valued and appreciated. We had a Poppy Project! 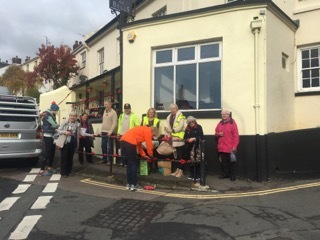 Bishopsteignton Parish Council discussed our plan and gave us their blessing including offering some welcome financial assistance for the cable ties. 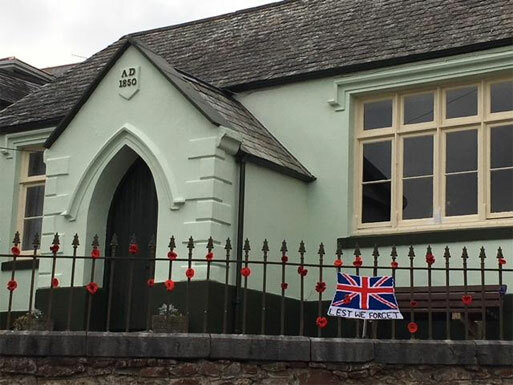 Bishopsteignton Heritage were researching the lives of the people whose names are on the War Memorial, and Bishopsteignton Primary School were teaching children about the First World War as part of their curriculum. The Poppy Project joined forces with the Heritage group and the School in providing a shared learning experience for the children. 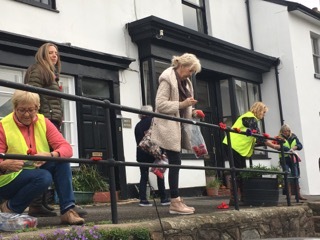 Six stalwart members of the Poppy Project went armed with knitting needles, balls of wool and finger knitting instructions to teach year 5 and 6 how to knit and create poppies for the memorial. 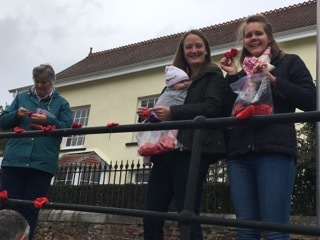 All sixty children created wonderful poppies and poppy petals to be displayed on the railings in Fore Street. Then came a request from the Brownies and then the Scouts! 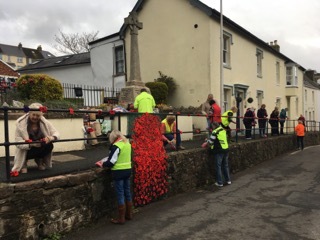 Overall, the young people from these village groups made 200 poppies and it is fair to say the Poppy Project’s stalwart six thoroughly enjoyed the experience too! 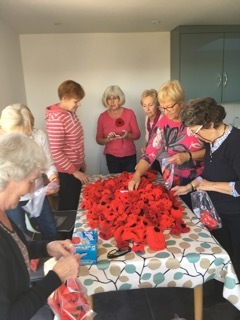 The WI and the local knitting group were amazing and produced hundreds and hundreds of poppies. 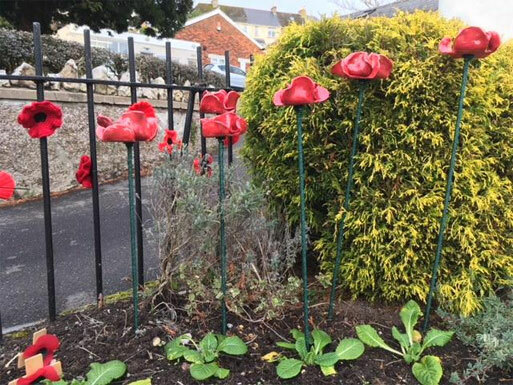 Included in the poppy making were the creation of six beautiful ceramic poppies made by Yvonne Hellin-Hobbs. We set up ‘Knit & Natter’ sessions at my house with people volunteering to help with the project. The poppies were bagged into fifties and they were laid two bags deep around our kitchen floor! The amount of poppies that kept arriving at the door overwhelmed us. When the total amounted to over one thousand, we were amazed and felt the pressure was off! A tide of poppies arrived during that final week. We were answering the door five or six times a day. The new total was three hundred short of two thousand! Keep knitting team; we can do it! These gatherings became more frequent as we drew nearer to November 11th, 2018. 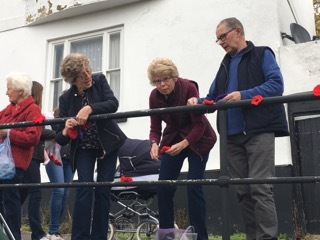 We held two sessions a day during the last week to keep count of the poppies and prepare them in bags of manageable twenties complete with zip ties ready for the installation. It was during this time that the value of these volunteers became apparent. None of this would have happened had it not been for them turning up and persevering until the task was completed. Poppies were arriving so frequently that we lost count at two thousand two hundred! Despite the day being slightly rainy, around thirty people turned up at the Memorial. 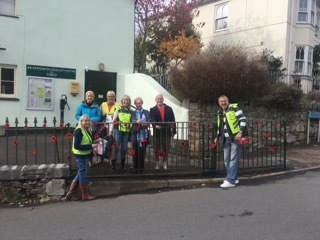 We handed out bags of poppies with zip ties, and off they went down the road to tie them onto the railings. 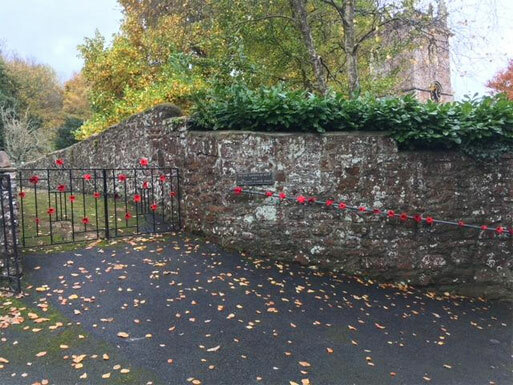 Over one thousand poppies were tied to the black railings from the War Memorial down to the Ring of Bells. The remainder of two thousand five hundred poppies were tied to gates and lampposts. A beautiful display was seen over the wall of Haldon House made by Helen Jane Kelham, poppy streamers and poppies decorated the front of the Ring of Bells, a central purple poppy in remembrance of animals killed in the WW1 surrounded by red poppies was placed on the gate of Fran & Nigel Edwards’ house, a crocheted Union Flag was secured on the railings of the Community Centre, poppies were placed around trees in Shute Hill and a trail led down to St John’s church gates, including a cross of poppies placed inside the church. The War Memorial looked resplendent with a surround of waving poppies and the six ceramic poppies standing tall in the garden. What an amazing sight for everyone to see as they travelled along Fore Street! Following contact with BBC local news, we were lucky enough to be called back by the Spotlight local news team. They arrived on the Wednesday before Remembrance Sunday and interviewed several local people. 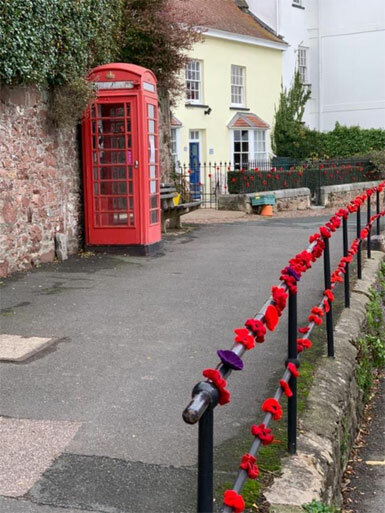 Five schoolchildren from Bishopsteignton Primary School, who were involved in the poppy making, played a special part in the news item and were very knowledgeable and eloquent when answering questions. 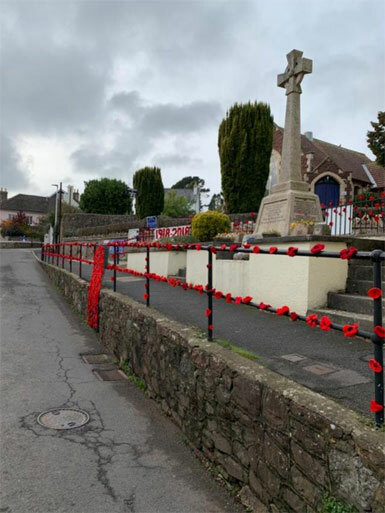 It was very exciting to have the television crew here broadcasting our Road of Remembrance across the local area of the country and seeing Bishopsteignton portrayed in such a positive light. The poppies will be collected and cleaned, and stored for future remembrance events. Some will be turned into buttonholes for sale. All proceeds will go to the Royal British Legion. 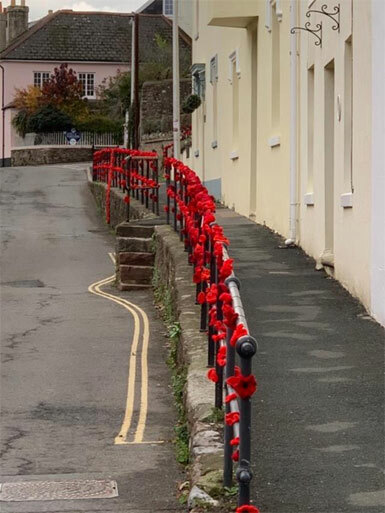 I am humbled to be part of creating this Road of Remembrance, lines of poppies reaching through the village, prompting us to remember the sacrifice of those ordinary people who lived here in Bishopsteignton over 100 years ago. A really sincere thank you to everyone who contributed poppies to this memorial, the number was beyond expectation. Also thank you to the team of people who willingly gave their time to make the whole poppy installation happen, you know who you are. 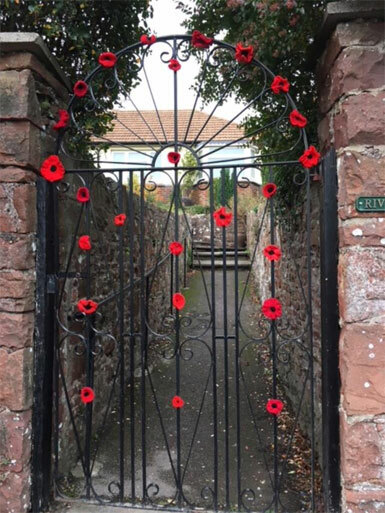 And thank you to everyone in the village who came out to admire the poppies and remember those people whose names are etched on our village War Memorial.